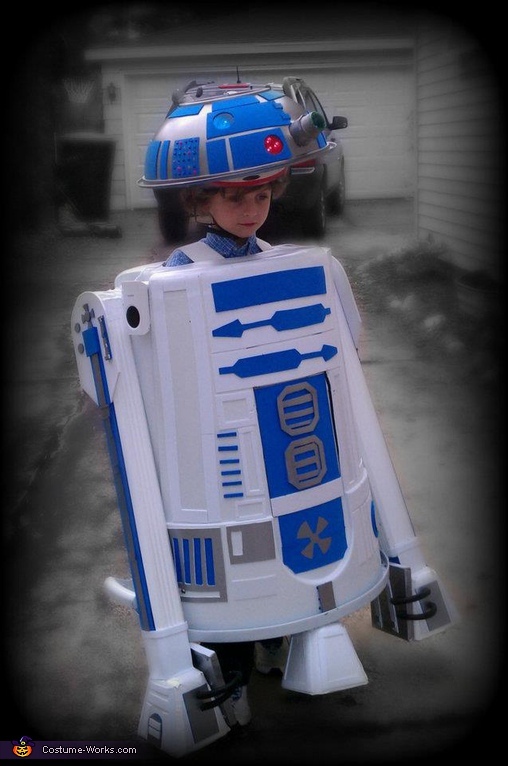 This homemade costume for kids entered our 2011 Halloween Costume Contest. This costume is 100% Homemade! It has lights and sounds too! The costume is made out of a garbage can, bowl mounted to a bike helmet and plastic downspouts for the legs. The battery operated speakers played a loop of downloaded r2d2 sounds on the ipod and the lights are all battery operated dollar store lights! The details are craft foam cut into the proper shapes! that is amazing omg so cool!!! Would you be willing to make one for my son and if so, how much would you charge for it? Can you tell me what you used at the bottom of the downspouts? Love it! Where can I buy this? Love it. Would you be able to make one for my son and how much would it cost? How much would this costume cost for a six year old? Do you have instructions on how to make this including material list?